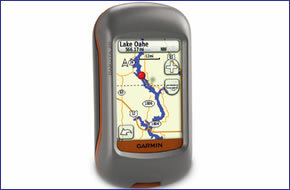 Garmin Dakota 20 is the perfect compact handheld GPS system for geocachers, hikers and walkers. Furthermore, the maps can be upgraded for use on foot, on a bike, in a car and on a boat making it a great all-round GPS device. The Dakota 20 features a 2.6-inch diagonal colour touchscreen display, is waterproof and includes a 3-axis compass and barometric altimeter. The Dakota 20 also supports paperless geocaching, storing up to 2,000 caches. Accessories are still available for your Dakota 20 click here. Likewise for maps click here. The palm-sized Garmin Dakota 20 measures just 55mm wide, 100mm tall and 33mm in depth. This makes it ideal for walking, hiking and geocaching. You can also upgrade this device for use on foot, on a bike, in-car and on a boat. At the centre of the Dakota 20 is a sunlight-readable 2.6-inch TFT colour touchscreen display. This device is built to be robust, is waterproof to IPX7 standards and has a 20 hour battery life, making it perfect for outdoor adventures and recreational pursuits. The Dakota 20 also features a built-in 3-axis electronic compass - which works even when the unit is not held level and barometric altimeter - which shows your exact altitiude and predicts changes in weather conditions. This Garmin handheld device has a high-sensitivity, WAAS-enabled GPS receiver with HotFix satellite prediction meaning it will quickly get a GPS connection and maintain this connection in built-up areas and dense woodlands, for example. The Dakota 20 supports paperless geocaching so there is no need for print-outs for each geocache. You can download up to 2,000 caches to the device providing you with details such as location, terrain, difficulty, hints and description. The unit also features a internal 850MB memory enabling you to store 1000 waypoints, 50 routes and 200 saved tracks. You can also share data related to you journey such as waypoints, routes and geocaches wirelessly with other compatible Dakota, Foretrex, Oregon and Colorado users at the press of a button. As standard the Garmin Dakota 20 comes preloaded with a worldwide basemap with shaded relief. Additional maps on pregrogrammed SD/microSD Card can also be purchased. Maps available include: City Navigator street-level road maps, BlueChart g3 marine charts and GB Discoverer Ordnance Survey LandRanger maps at 1:25k or 1:50k scale. Each of these maps are available on SD/microSD Card. Do you have a question about the Garmin Dakota 20 or other handheld GPS related question that's not been answered on this webpage? Please see our handheld and Outdoor GPS FAQs for questions from other customers. Plus if the answer to your question isn't featured, use the online form to ask us for the answer. Alternatively please telephone 01733 777623 Monday to Friday (9:30am-5:00pm) to speak to one of our sales team. Garmin Dakota 20 is preloaded with a Worldwide basemap with shaded relief. Please note: Additional maps can be loaded to the Dakota 20. The Dakota 20 features a SD/microSD Card slot, an easy way to add new maps and mapping updates. Looking for accessories to use with the Garmin Dakota 20 handheld device? We sell a vast selection of genuine parts and spares including Dakota 20 slip case, retractable lanyard, carabiner clip, battery charger, bike/handlebar mount, Garmin Tempe and chirp Geocaching Beacon. Garmin Dakota 20 is preloaded with a Worldwide basemap with shaded relief. However, a number of other maps supplied on SD/microSD Card are also compatible including street-level road maps - perfect for cycling of using your Dakota 20 in a car, 1:50k and 1:25k Ordnance Survey maps - ideal for hiking and walking the countryside of Great Britain and marine BlueCharts - ideal if you want to navigate the waters around the UK, Europe or further afield.